Who > H - L > Leggroan, Edward "Ned"
Leggroan was born into slavery on Christmas day, probably in 1840. David G. Lagrone, a farmer in Noxubee County, Mississippi owned him, his parents, and his siblings. He was valued in the David Lagrone estate papers at $1,200, indicating he was a strong, healthy young man who could work hard. Family lore later talked of Ned as an escaped slave, but no documentation supports that claim. The newly married couple made a decision that changed the course of their lives. They chose to join Ned’s sister, Amanda, and her husband, Samuel Davidson Chambers, on the long trek across the United States to make their home with the Mormons in the Great Salt Lake Valley. 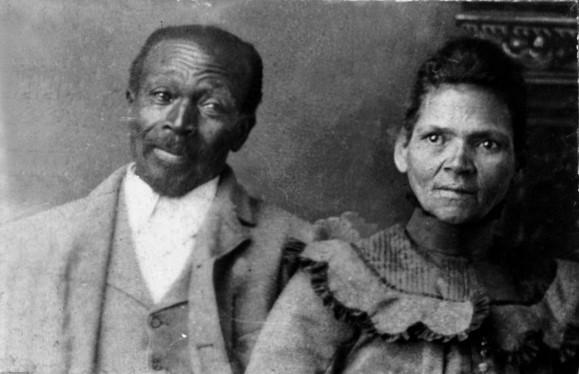 Samuel Chambers had joined the LDS church as a young slave boy but had to wait for emancipation before he could earn enough money and have the freedom to go West. The Leggroans must have known only what Samuel Chambers told them about the Mormon faith and likely knew little about what life might be like in Utah Territory. Ned and Susan and their three sons nonetheless made the journey from Mississippi to Utah with the Chambers family. The two families settled into the LDS First Ward in the spring of 1870. Ned found work as a stable hand that first year in Utah Territory and in December he and Susan had their first child together, a daughter. Just two months earlier, Susan’s oldest son, Samuel, had died. Andrew, her younger son must not have survived long either, because the 1880 census does not include him in the family. Ned’s son, Henry, from his first marriage, thrived and grew to adulthood in Utah. Church of Jesus Christ of Latter-day Saints. “Colored Brethren and Sisters, Endowment House, Salt Lake City, September 3, 1875.” Microfilm 255,498. Family History Library, Salt Lake City, Utah. “Correspondence.” The Elevator (San Francisco, California), 14 June 1873. Idaho Department of Health and Welfare. Bureau of Vital Records and Health Statistics. Leggroan, Ned. Certificate of Death. File No. 52733, Registrar’s No. 26. Boise, Idaho. Leggroan, Edward Or Ned. “Idaho, Southeast Counties Obituaries, 1864-2007.” Family History Library. Microfilm 100,464,678. Church of Jesus Christ of Latter-day Saints, Salt Lake City, Utah. “Leggroan.” Presiding Bishopric stake and mission census, 1914-1935. CR 4 311. Church History Library. Church of Jesus Christ of Latter-day Saints, Salt Lake City, Utah. “Ned Leggroan.” The Times Register (Idaho Falls, Idaho), 2 Feb 1926. Salt Lake County Recorder. Abstract Book B-3, page 259, line 8. County Recorder’s Office, Salt Lake City, Utah. United States. 1860 Census, Slave Schedule. Mississippi, Noxubee County. Utah. Salt Lake County Death Records, 1849-1949. Sameann Legrow. 30 Oct 1870. Microfilm 4,139,616. Family History Library, Church of Jesus Christ of Latter-day Saints, Salt Lake City, Utah. Arrington, Leonard J. History of Idaho. Moscow: University of Idaho Press, 1994. Hornsby, Alton, Jr., ed. Black America: A State-by-State Historical Encyclopedia, Vol 1: A-M. Santa Barbara: ABC-CLIO, 2011. “Ned Leggroan,” The Times Register (Idaho Falls, Idaho), 2 February 1926, 2, 5. “Former Slave Dies in Idaho: Colored Convert Mormon Religion to Be Buried by Whites,” The Salt Lake Tribune (Salt Lake City, Utah), 2 February 1926. United States, 1850 Census, Slave Schedules, Mississippi, Noxubee County. Lagroane held quite a few slaves, among whom is a black male aged ten years in 1850. “Descendants of Green Leggroan,” compiled by I. Marc Carlson. As problematic as it is to set a dollar value on human beings, it was routinely done as estates were probated and slaves were parceled out to heirs in the South. In fact, slaves were a very valuable part of an estate. “Correspondence,” The Elevator (San Francisco, California), 14 June 1873. Thanks to Christopher Jones for his research which uncovered this important bit of information. Salt Lake County Recorder, Abstract Book B-3, page 259, line 8, Salt Lake City, Utah. “Leggroan,” Presiding Bishopric stake and mission census, 1914-1935. CR 4 311, Church History Library, Church of Jesus Christ of Latter-day Saints, Salt Lake City, Utah. Homestead Patent, IDIDAA048582, for 160 acres. Frances [Leggroan] Fleming, oral interview by Leslie Kellen, Salt Lake City, Utah, 1983, transcript, “Interviews with Blacks in Utah, 1982-1988,” Ms 0453, Special Collections, J. Willard Marriott Library, University of Utah, Salt Lake City, 93-94. “Former Slave Dies,” Salt Lake Tribune.